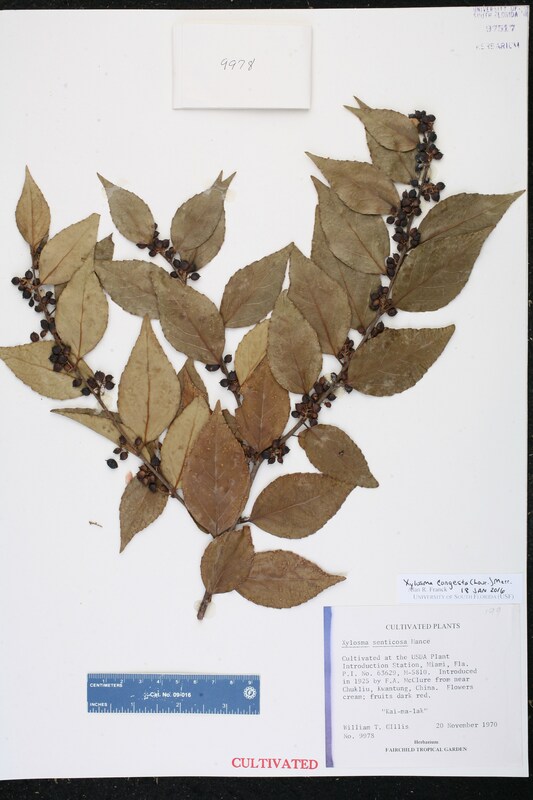 Citation XYLOSMA CONGESTA (Loureiro) Merrill, Philipp. J. Sci. 15: 247. 1920. 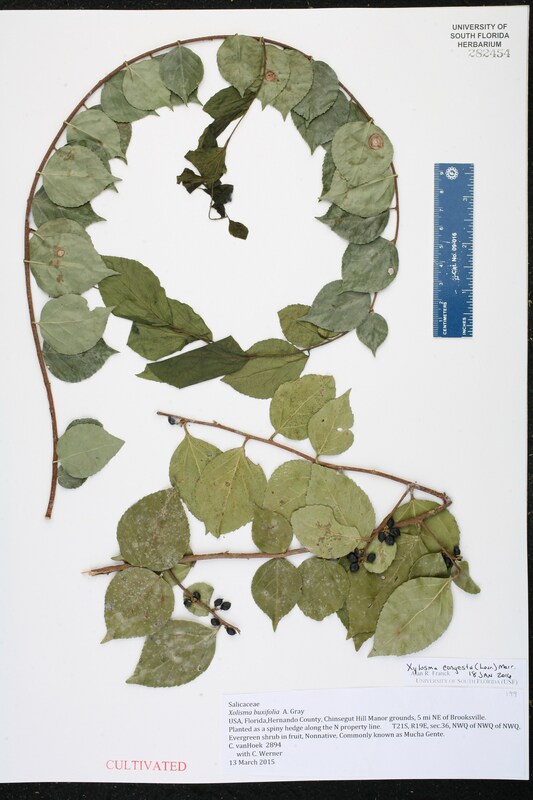 Basionym: Croton congestus Loureiro 1790. Kurkas congestum Kurkas congestum (Loureiro) Rafinesque, Sylva Tellur. 62. 1838. 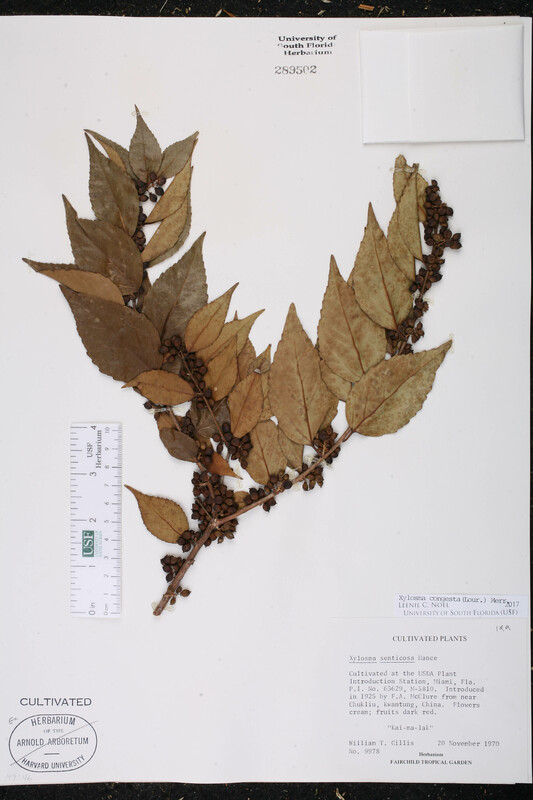 BASIONYM: Croton congestus Loureiro 1790. Flacourtia japonica Flacourtia japonica Walpers, Repert. Syst. Bot. 1: 205. 1842. 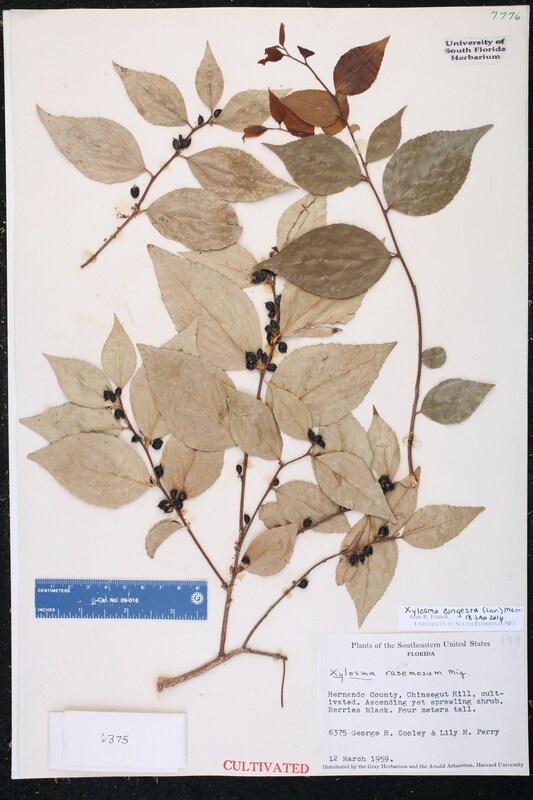 BASIONYM: Hisingera racemosa Siebold & Zuccarini 1841. 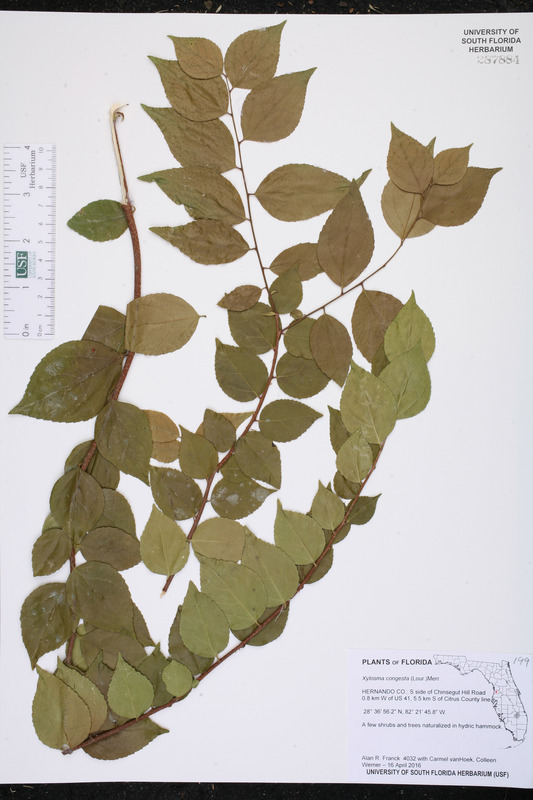 Myroxylon japonicum Myroxylon japonicum (Thunberg) Makino, Bot. Mag. (Tokyo) 13: 53. 1904. BASIONYM: Apactis japonica Thunberg 1783. Myroxylon racemosum Myroxylon racemosum (Siebold & Zuccarini) Kuntze, Revis. Gen. Pl. 1: 44. 1891. 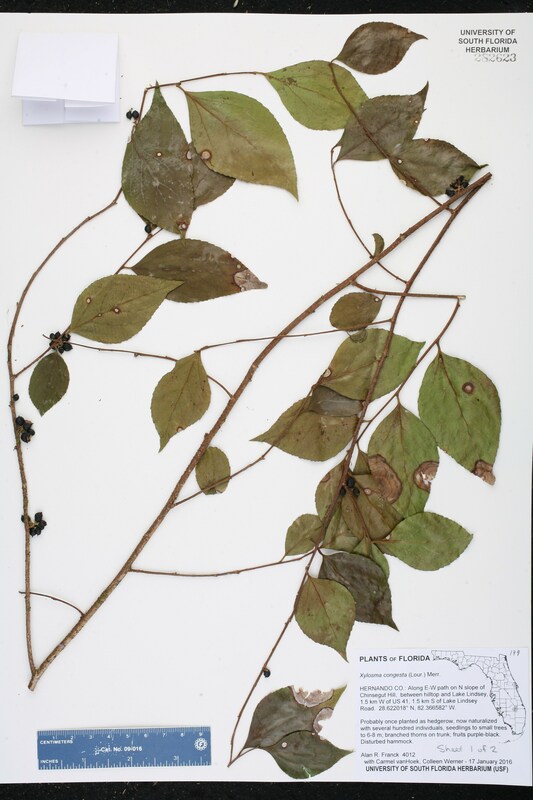 BASIONYM: Hisingera racemosa Siebold & Zuccarini 1841. Xylosma apactis Xylosma apactis Koidzumi, Bot. Mag. (Tokyo) 39: 316. 1925. BASIONYM: Apactis japonica Thunberg 1783. 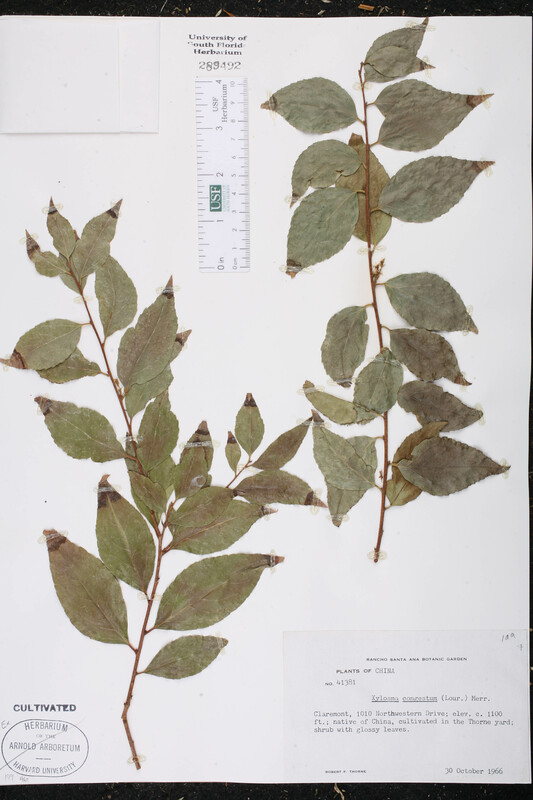 Xylosma congesta var. pubescens Xylosma congesta (Loureiro) Merrill, var. 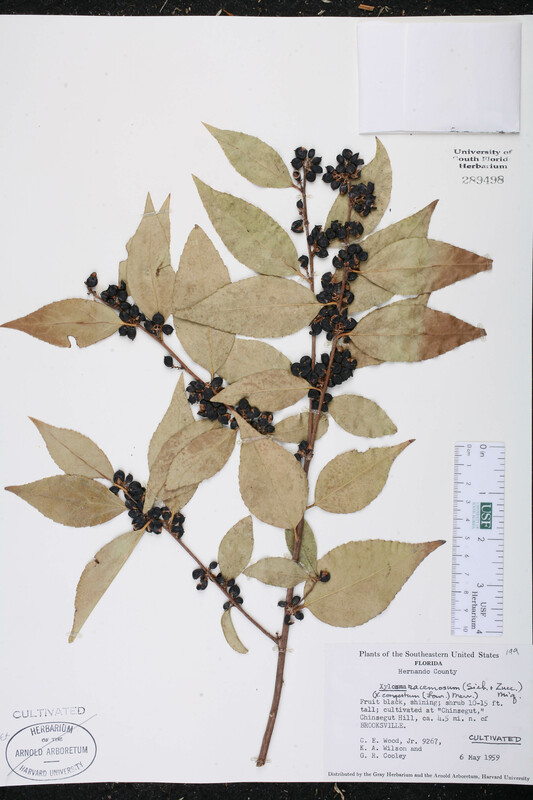 pubescens (Rehder & E. H. Wilson) Chun, Sunyatsenia 1: 275. 1934. 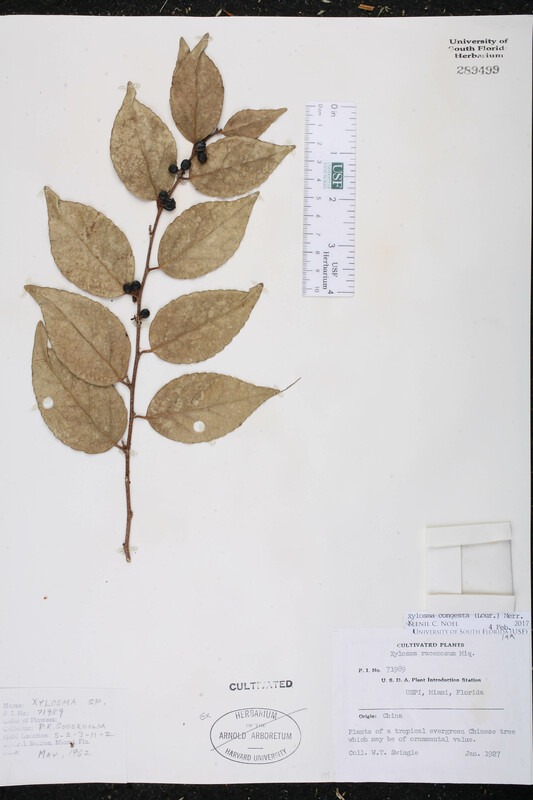 BASIONYM: Xylosma racemosa (Siebold & Zuccarini) Miquell, var. 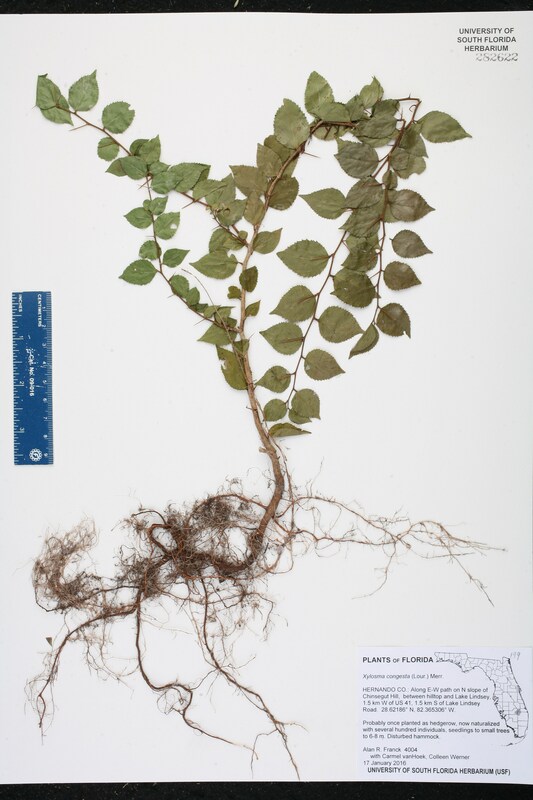 pubescens Rehder & E. H. Wilson 1912. Xylosma japonica var. 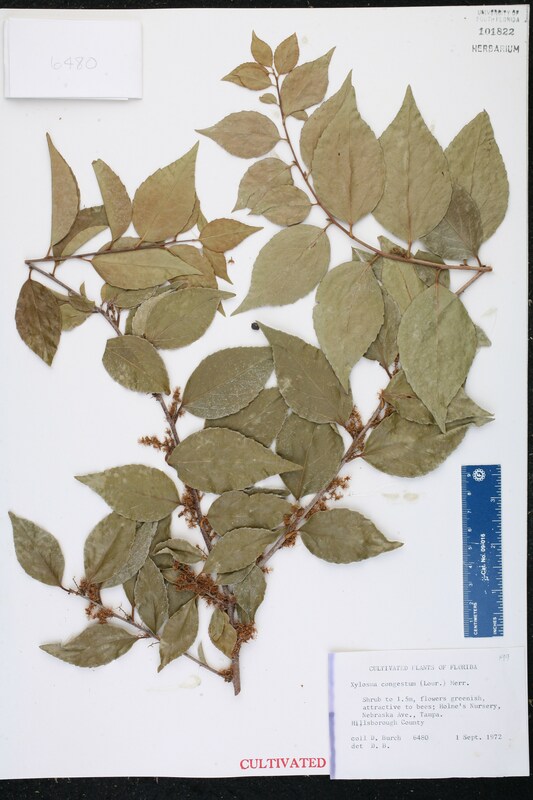 pubescens Xylosma japonica A. 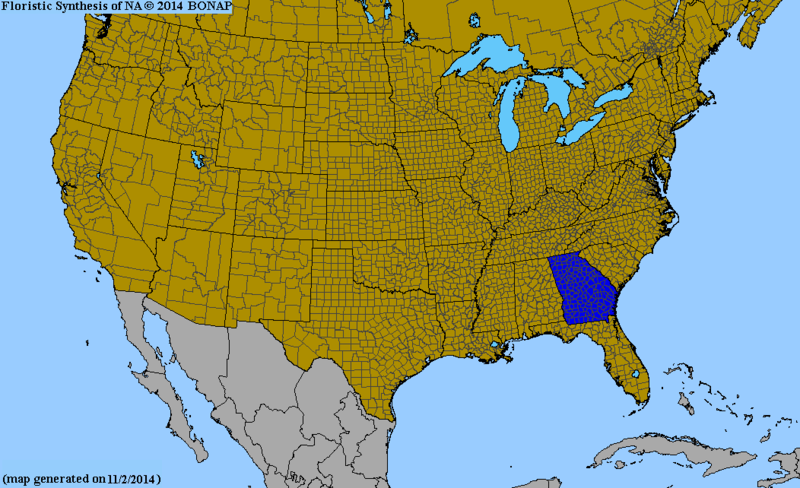 Gray, var. 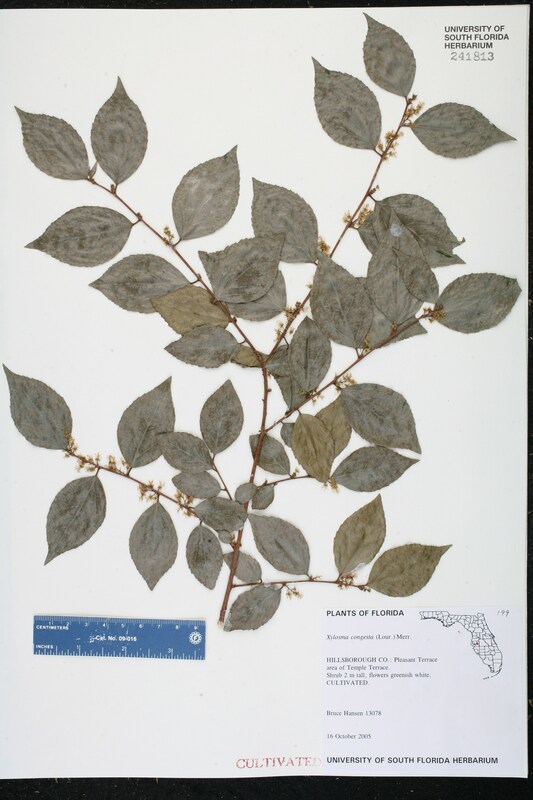 pubescens (Rehder & E. H. Wilson) C. Y. Chang, Fl. Tsinling. 1; 326. 1981. 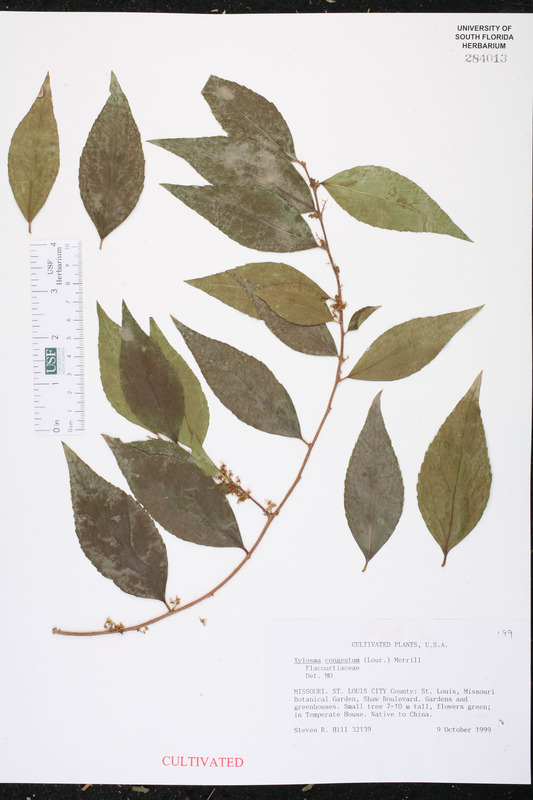 BASIONYM: Xylosma racemosa (Siebold & Zuccarini) Miquell, var. 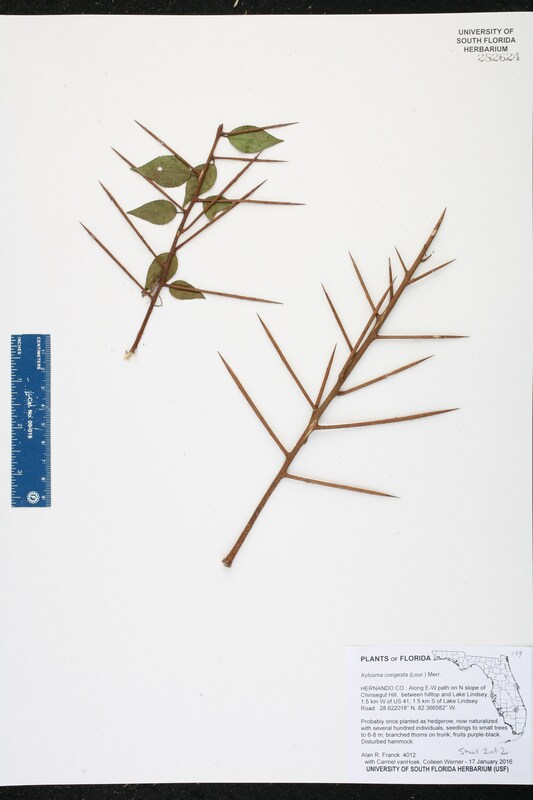 pubescens Rehder & E. H. Wilson 1912. 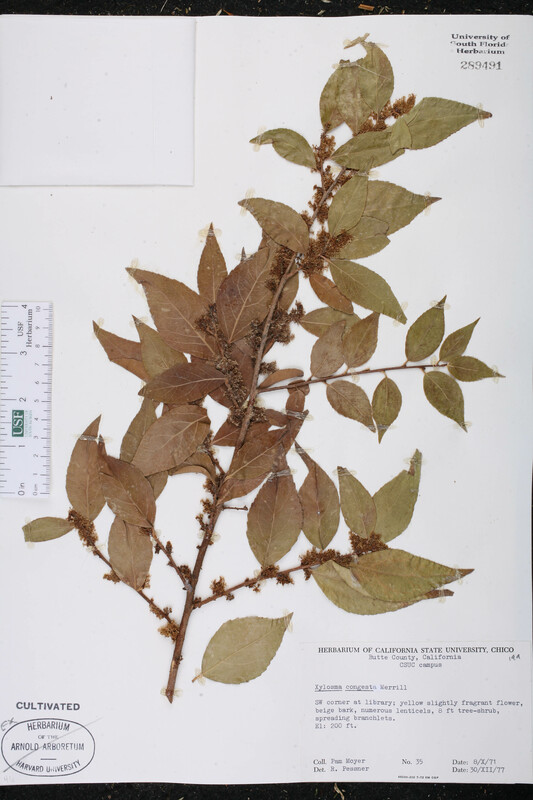 Xylosma racemosa Xylosma racemosa (Siebold & Zuccarini) Miquel, Ann. Mus. Bot. Lugduno-Batavi 2: 155. 1865. 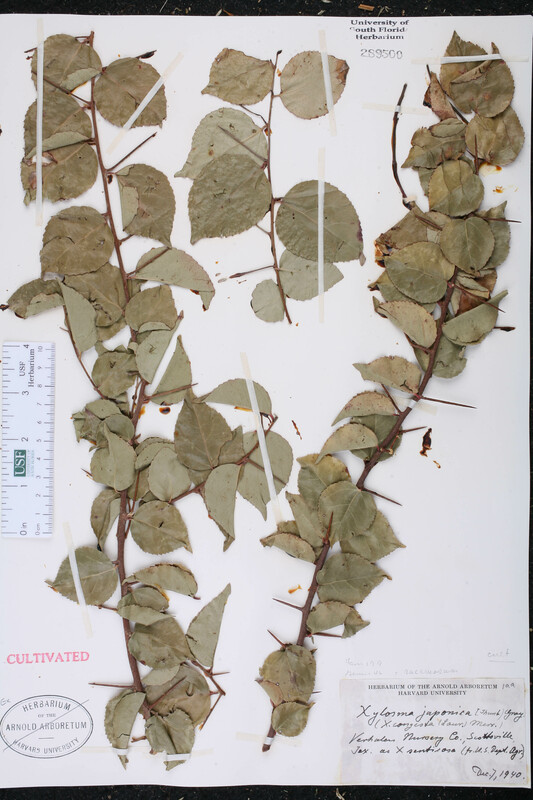 BASIONYM: Hisingera racemosa Siebold & Zuccarini 1841. 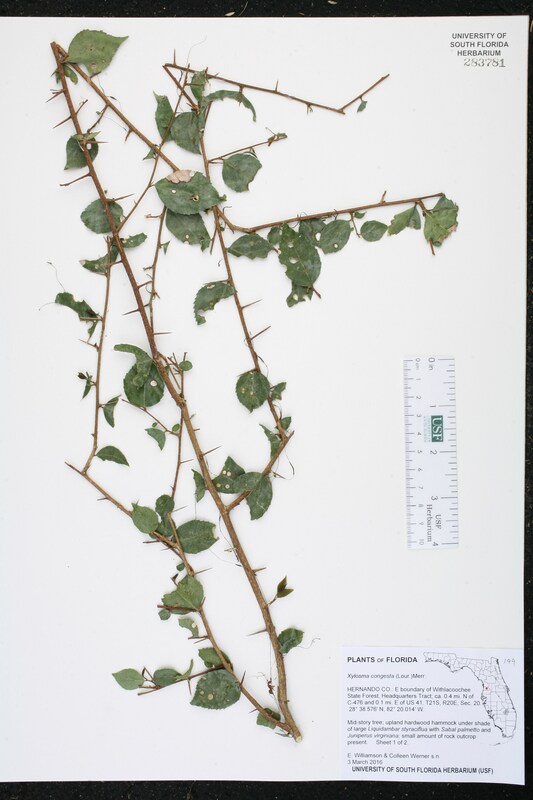 Xylosma racemosa var. caudata Xylosma racemosa (Siebold & Zuccarini) Miquel, var. caudata (S. S. Lai) S. S. Lai, Fl. Reipubl. Popularis Sin. 52: 40. 1999. 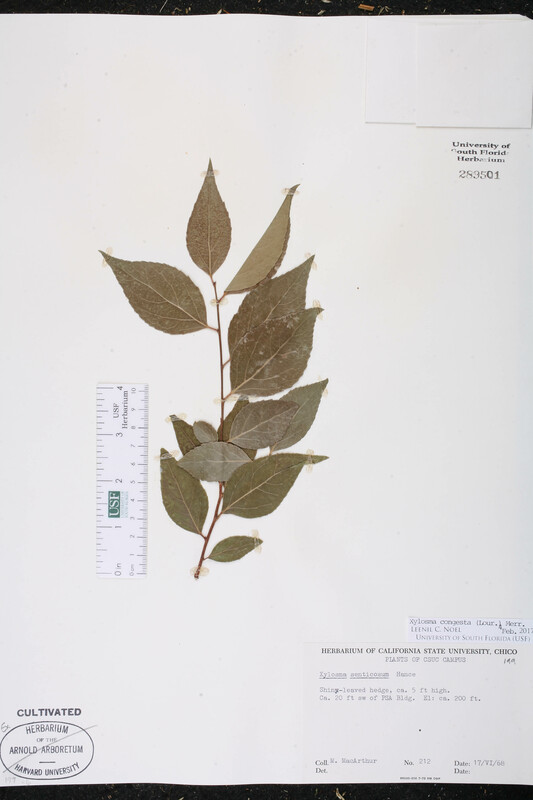 BASIONYM: Xylosma congesta (Loureiro) Merrill, var. caudata S. S. Lai 1994. USA Florida Hillsborough Co. 16 Oct 2005 B. F. Hansen 13078 CULTIVATED. 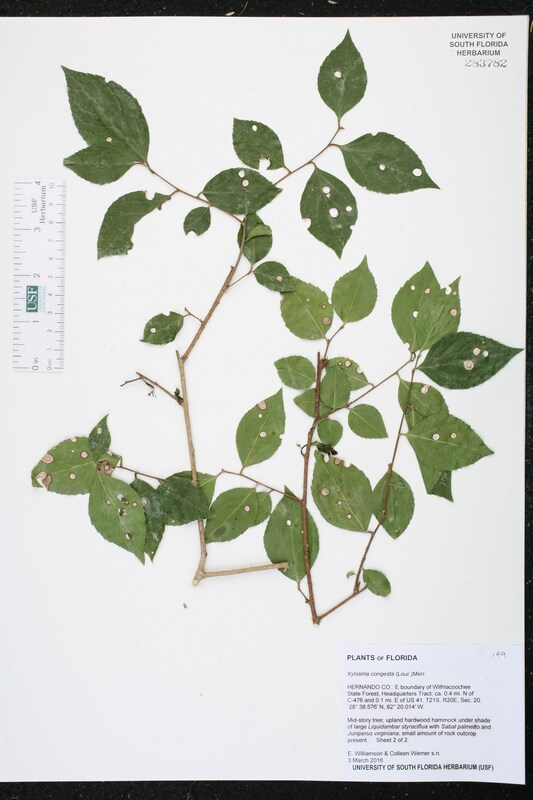 USA Florida Hillsborough Co. 01 Sep 1972 D. Burch 6480 CULTIVATED. USA Florida Hernando Co. 12 Mar 1959 G. R. Cooley 6375 CULTIVATED. USA Florida Miami-Dade Co. 20 Nov 1970 W. T. Gillis 9978 CULTIVATED. 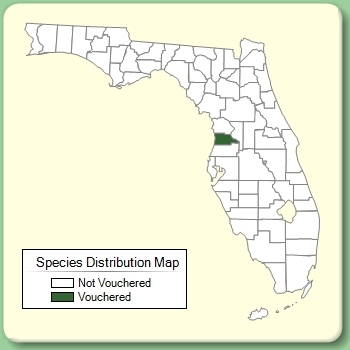 Introduced in 1925 by F.A. McClure from near Chukliu, Kwantung, China. USA Florida Hernando Co. 13 Mar 2015 C. vanHoek 2894 CULTIVATED. USA Florida Hernando Co. 17 Jan 2016 A. R. Franck 4012 Sheet 1 of 2. USA Florida Hernando Co. 17 Jan 2016 A. R. Franck 4012 Sheet 2 of 2. USA Florida Hernando Co. 03 Mar 2016 E. Williamson s.n. Sheet 1 of 2. USA Florida Hernando Co. 03 Mar 2016 E. Williamson s.n. Sheet 2 of 2. USA Missouri St. Louis Co. 09 Oct 1999 S. R. Hill 32139 CULTIVATED. Native to China. USA California Butte Co. 08 Oct 1971 P. Moyer 35 CULTIVATED. USA California Los Angeles Co. 30 Oct 1966 R. F. Thorne 41381 CULTIVATED. Native of China. USA Florida Hernando Co. 06 May 1959 C. E. Wood, Jr. 9267 CULTIVATED. USA Florida Miami-Dade Co. Jan 1927 W. T. Swingle s.n. CULTIVATED. P.I. 71989; origin: China. USA Texas Harrison Co. 07 Dec 1940 unknown s.n. CULTIVATED. USA California Butte Co. 17 Jun 1968 M. MacArthur 212 CULTIVATED. USA Florida Miami-Dade Co. 04 Aug 1970 W. T. Gillis 9727 CULTIVATED. P.I. 141230, M-11055; introduced by F. A. McClure from Chuklin, Kwantung, China via Chico, California Introduction Garden. USA Florida Miami-Dade Co. 20 Nov 1970 W. T. Gillis 9978 CULTIVATED. P.I. 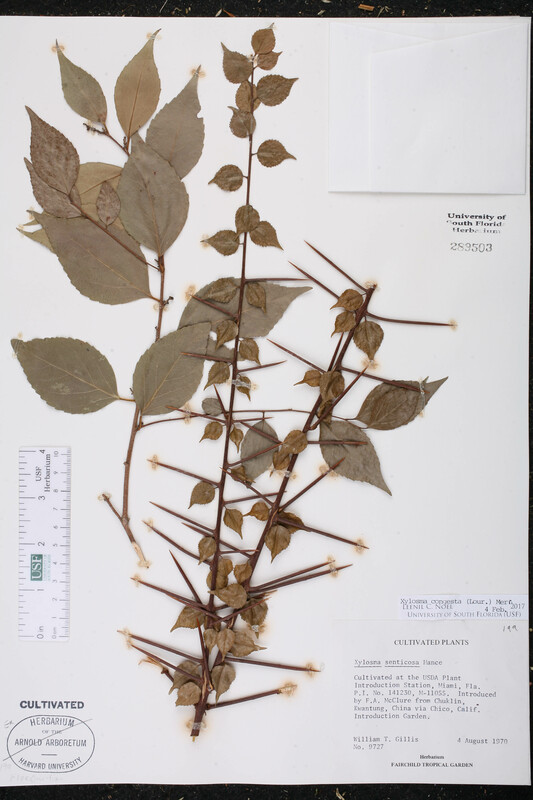 63629, M-5810; introduced by F. A. McClure from Chuklin, Kwantung, China.